German ideas about Mittel Europa, and as a part of this, German political thought towards South-East Europe has evolved for over 200 years. During the European reconstruction after the Napoleonic Wars, the 39 German principalities – including Prussia, Bavaria and the four Free Cities – played second fiddle to other events, or were the subject of decisions made in London, Vienna and St Petersburg. Then, the major issue for German politics was to end geographical disintegration, and create economic and political unity. However, in this period, ideas emerged envisaging national unity beyond geographical limits determined by linguistic dividing lines, and linking it to the idea of a broader Central European economic union. Johann Gottlieb Fichte (1762–1814) envisioned a unified German state as a national state limiting its external trade to a minimum (Der geschlossene Handelsstaat Tübingen, 1800). But his followers, such as Friedrich List (1789–1846) thought in much broader geographical terms. List was convinced that the future was in the creation of greater economic units, and if the German states wanted to become a Great Power, their customs union (formed in 1834) would also have to unite their trade policy. Then the Germans would have to form a political confederation with Belgium, Switzerland and Denmark and, finally – together with Vienna and Budapest – they would have to occupy the position of the declining Ottoman Empire on the Balkans, strengthening their influence to the Mediterranean and the Black Sea. Ottoman rule – as he wrote not soon before his death – ‘would have to be succeeded by a German-Hungarian Eastern Empire, whose frontiers would have been washing by the Black Sea and the Adriatic Sea, and which would be dominated by German and Magyar spirit.’ Apart from the theoretical framework of Mittel-Europa, more practical ideas, such as the Berlin-Baghdad railway, could also be linked to List. From then, the Mittel-Europa idea persisted in German political thought; it became a realistic political program after German economic unity in 1871, and not least because of the new German state’s political and military power especially during the 1890s. As such, it appeared as the complimentary element of German imperialism and colonial policy, and – according to some opinions – as an alternative of this, it united certain political and economic alternatives. The various plans that emerged between 1890 and 1914 can be organized into four main categories. The export oriented industries, banks and industrial managers aimed for a multi-national customs area, which as a core included a German-Austrian-Hungarian bloc, but included the Balkans, the Benelux states as well as France and Scandinavia. This plan neither aimed to reduce international trade, vital for Germany, nor to politically repress the member states of the German customs union, and did not threaten their sovereignty or planned territorial annexation. One of the most well-known concepts is that of Frederich Naumann, protestant theologist and social-reformer, whose book Mitteleurope was published in German in 1915, and in Hungarian in 1916. Supported by the big land owners and the All-German Union (Alldeutcher Verband), these ideas, characterised by different völkisch and racial-biological theories, primarily aimed to subjugate the Central European region. And at the same time, in this framework, the Mitteleuropa concepts implied the inclusion of Polish and Russian territories in the East and Northern French and Belgian territories in the West (Weltpolitik versus Lebensraum). Regardless of the significant differences in these concepts, there are certain similarities: the expansion of the ‘Small German’ base of the 1871 empire towards the Atlantic Ocean in the West, and towards the Black Sea in the Southeast. This German dominated neo-mercantilist region was also supposed to guarantee the security of the region, as a fourth world power, against Britain, Russia and the United States in a future global crisis. The imperial political leadership favoured the liberal-imperialistic version of the Mitteleuropa idea until 1917. However, in 1914, German chancellor Theobald von Betthman-Hollweg (1909–17) still claimed: ‘A common Central European economic union is achievable, through custom union agreements, which would include France, Belgium, Holland, Denmark, Austria-Hungary, Poland, potentially Italy, Sweden and Norway. This union – without common constitutional union, with the nominal freedom of states, although under German leadership – has to guarantee Germany’s economic rule over Central Europe.’ After Russia’s withdrawal from the war in 1917, government circles, enjoying the full support of the military high command, also started to think along the lines of annexationist ideas, which would have reduced Russia to the frontiers it had under Peter the Great (1682–1725) at the beginning of the 18th century. Thus, they aimed to settle an important part of the detached Russian, Ukrainian, Polish and Baltic territories with Germans. After the Peace Treaty of Brest-Litovsk between the Central Powers and Soviet Russia, for a brief period in the spring and summer of 1918, it seemed that the German political-economic bloc was achieved in the East. The Spa Agreement, signed between Austria-Hungary and Germany on 12 May 1918, provisioned a close economic, political and military union between the two states eventually leading to a customs union; Serbia and Romania were under German and Austro-Hungarian occupation; Bulgaria and Turkey, as well as the newly created states of Ukraine and Finland also belonged to the German alliance system. As a result of military defeat and the Versailles peace treaty, Germany not only lost its colonies and European acquisitions, but also temporarily lost its Great Power status, which it acquired between 1866 and 1871. However, the potential for Germany’s future ascendancy remained. With large American loans, the German economy had already recovered by the 1920s, regained its Great Power status in the continent by the early 1930s, and by the mid-1930s, it aspired to become a world power. We are concentrating on one aspect of this ascendancy and eventual fall – Germany’s policy toward South-East Europe, more precisely, towards Hungary. Instead of analysing economic relations, conditions of the German minorities and the Nazi military leadership, which have been studied extensively, our focus here is the development of German South-East European policy, its relations to Mitteleuropa ideas, its integration into foreign policy, and the reaction of target countries, especially Hungary. Until its collapse, Austria-Hungary occupied a special role in German federation plans. Due to its German character, its middle-power status, and common foreign political aims, the Monarchy was not only the subject of German strategy, but was also the partner of Berlin. After the redrawing of the frontiers of the region after 1918, this situation had also changed. Austrian independence was considered by the German leadership as a temporality, and they were convinced that Austria would eventually become the part of Germany. On the other hand, Hungary – significantly weakened from all points of view – became one of the South-East European ‘medium and small states’ which were industrially under-developed and irreconcilably hostile towards each other, which the 1929 report of the German Foreign Ministry considered ‘as a whole … balkanised.’ Reflecting on this idea, the notion of Südeuropa became deeply entrenched in Germany. It included primarily Hungary, Romania, Yugoslavia and Bulgaria, as well as on an ad hoc basis Albania and Greece. 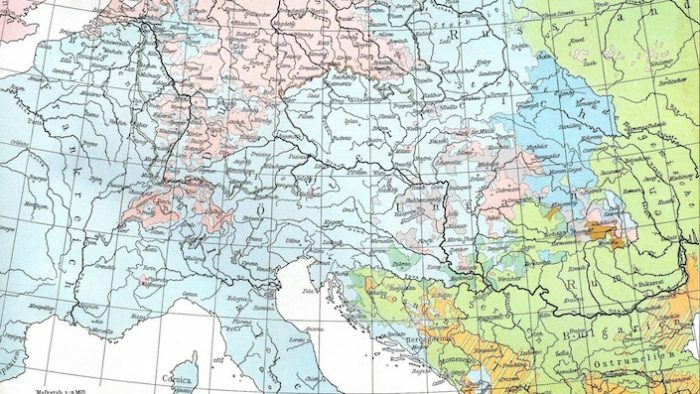 On the other hand, the term Balkan-Donauraum also did not disappear completely, but perhaps the difference between the two became even more blurred. German political interest towards the region – for the reason that the countries still complemented each other economically – did not diminish compared to the pre-war era, but actually increased. Paradoxically, the conditions were all there. The strengthening of ties and links, broken at Versailles, now had better opportunities in the long-run as a result of the atomization of the region, the break-up of the Habsburg Monarchy and the permanent weakening of Russia. The only question remaining was when and how Germany will be able to reverse French, and to a lesser extent British and Italian, influence in the region. The foreign policy of the Weimar Republic between 1923 and 1929, under the leadership of Gustav Stresemann, had two strategic aims: reestablishment and strengthening of economic and trade links, and the support of German minorities. Accordingly, already in the beginning of the 1920s, Germany signed commercial treaties with Yugoslavia, Bulgaria and Hungary on the mutual basis of the most favoured nation clause. Germany’s share of the foreign trade of these countries had already multiplied between 1920 and 1923. Because of certain prolonged disputes regarding the 1917–18 German occupation of Romania, Berlin signed such a treaty with Bucharest only in 1928. Regardless, German-Romanian trade had already intensified in 1921–22, and Romania’s most important trading partner from 1923 was Germany. At the same time, Germany was only the third most important trading partner for Hungary and Yugoslavia. This hierarchy was not accidental. Abundant in certain raw materials, Romania and Yugoslavia – regardless of their political allegiance to the French alliance system – became the important trading partners of Germany in South-East Europe. On the other hand, Hungary and Bulgaria primarily became important as markets and agricultural producers and played a less important role in German thought. It was noted that ‘… [T]he opportunities for the German economy in Romania are greater than in any other countries in East Central Europe’; and also in Yugoslavia, ‘as the strongest and most promising Balkan countries,’ explained a Foreign Ministry note. The German foreign political aim to strengthen German minorities cannot be signified in trade relations only. However, from the available fragmentary evidence, it can be argued that the funds provided by Berlin for the moral and political support of German schools, press and churches, as well as the several economic and cultural associations, and education of the minority elite (scholarships) all played a significant role. This was the case regardless of the fact that, compared to the German minorities living in Belgium, Denmark, Poland, Czechoslovakia and the Baltic region (Grenzdeutsche), South-East Europe (Auslandsdeutsche or Volksdeutsche) always lacked priority in official policy. This intentional restrain, which contradicts policy towards South-East Europe during and before the war, can be explained with Stresemann’s policy (sketched in 1919, but becoming official only in 1923) that primarily aimed for peace with the Western powers and the recognition of Germany’s Western frontiers. Also it pursued the final settlement of German reparations, restoration of German sovereignty in the Saar and the Rhineland, the peaceful revision of the Eastern frontiers, and the Anschluss. A more active German policy in the region would have eventually clashed with French Danubian and Balkan strategy, and would have compromised current German reconciliatory tendencies. Paris, at least in words, showed a certain leniency towards the unification of Danzig and Germany, and the elimination of the Polish Corridor, which cut Prussia into two. However, nobody expected it to concede to the idea of a German sphere of influence stretching from the North Sea to the Black Sea. The Hungarian public and the political elite did not understand Stresemann’s foreign policy, his South-East European strategy, and the role he envisaged for Budapest as an independent polity without Vienna. When the Hungarians understood, they adopted an offended stance. Their elite, which were socialized in the final decades of the Habsburg Monarchy, felt that Hungary’s small power status was only temporary, and remained captive of notions about a Hungarian Empire. Budapest attempted to deal with the German leadership as an equal partner or, at least, in accordance with primus inter pares principle (with which, it also perceived its neighbours). Hungary considered it evident that because of century-long cultural connections, the sharing of fate against the ‘sea of Slavs’ and military comradeship in the Great War, Germany would help Hungary, and would effectively support Budapest’s revisionist ambitions. It necessarily had to realise this was a pipedream. Gaining momentum after the 1927 Treaty of Eternal Friendship signed with Italy, Hungary renewed its diplomatic efforts for achieving a political collaboration with Germany in 1927–28, and also for the creation of a German-Italian-Austro-Hungarian revisionist bloc. However, the German attitude remained cool. Stresemann instructed his Envoy in Budapest to act like he did not know about the Hungarian proposition. ‘Joining the Italian-Hungarian cooperation is out of the question, as it would negatively affect our relationship with France and Yugoslavia’ – he explained. The continued rejection of Hungarian overtures did not mean that Germany was not aware of the ethnographic injustices of the Trianon Peace of 1920, and would not consider certain elements of Hungarian revisionist aims justified. In one of his conversations with the Czechoslovak Foreign Minister Edvard Beneš (1918–35), German Under-Secretary of State for Foreign Affairs Carl von Schubert (1924–30) clearly referred to this. Of Beneš’s accusations, he declared: ‘… truly, just like for most of their history, the Hungarians are restless. On the other hand, I have to state that this restlessness is justified. It was the gravest mistake to cut deep into Hungarian ethnic space.’ Similarly, in 1928 Schubert told Kálmán Kánya (the Hungarian Minister in Berlin), who persistently argued for revision and the similar fate of Germany and Hungary, that: ‘The Hungarians, to a certain extent, have to be patient with us. It is completely clear that one State could help another State, like one person helps another, if it is healthy and has fully recovered its strength.’ In the context of Germany’s strategy, it should have been understood in Hungary that until Germany’s minimal demands (the final settlement of reparations, the withdrawal of occupational forces from the Rhineland, the resolution of the problem of Danzig and the Polish Corridor) are met, Germany’s hands are tied and it cannot endorse Hungarian revisionist claims. Apart from revisionism, and differences in opinions about political collaboration, there were other problems in the German-Hungarian relationship. One of these was the collaboration of the German (Bavarian) and Hungarian far-right in the early 1920s which was tolerated and to a certain extent supported by the Hungarian political leadership. The more democratic and more careful German leadership disapproved of this. In 1922, Germany protested against Hungary hiding the leaders of the Kapp coup (1920) and the killers of Matthias Erzberger, and recalled its Budapest Envoy Franz Egon Fürstenberg who was too lenient towards Bethlen. In the second part of the 1920s, the main issue in the bilateral relations was the question of German schools in Hungary. The Bethlen government attempted to solve this problem in 1923 by organizing three types of schools. In type A, the language of instruction for all subjects was German, type B schools were bilingual, while in type C schools, German was taught as a foreign language. In theory, this system would have been satisfactory to all. But, the government never funded type A and B schools to the extent it did type C ones. Accordingly, the number of type A schools reduced from 49 to 33 between 1924 and 1927, type Bs from 73 to 55, while type Cs increased from 169 to 265. Bethlen also criticized the privileges German youth from Hungary enjoyed against other Hungarians in German state scholarships. He was also suspicious towards the extensive traveling of German youth to Hungary, and their growing networks there. He did not consider this as a naturally developed relationship between German minorities and the German mother country, but as tools and an attempt of pan-German advance into Hungary. In the 1920s, Bethlen often referred to the dangers of a consequently German advance into Hungary. The promotion of a German-Hungarian revisionist collaboration, and criticism towards revisionist-expansionist Germany were apparently in contrast to each other. On the level of rhetoric, this could be reconciled by overemphasizing the role of Hungarians in South-East Europe and with rosy viewpoints about German-Hungarian collaboration, but these two were irreconcilable. Apart from these, there were also other issues troubling German-Hungarian relations in the second half of the 1920s: the critical voices of the German left-wing press towards the anti-democratic social structure and policies of the Hungarian government; the question of Burgenland; and the trade balance which became more and more favourable for Germany, but more and more un-favourable for Hungary. The most important of these was the latter. Between 1922 and 1929, the volume of German industrial imports into Hungary significantly exceeded Hungarian exports to Germany. The primary reasons for this were very strict German sanitary regulations, and strongly protectionist German agrarian policy and the 1925 custom tariffs. By 1927, the Hungarian export of cattle was severely diminished, and other meat exports were also significantly reduced. Thus, from 1925 onward, the Hungarian government constantly lobbied for the revision of the 1920 commercial treaty, and the signing of a mutually beneficial new trade agreement. But, because Germany was satisfied with the situation, and also had no interest in improving political relations with Hungary, Berlin seemed to constantly postpone such decisions. Preparatory talks remained in preliminary stages until 1930. The problem surrounding Burgenland was that Hungary never gave up hope to recover this territory, transferred to Austria in 1921, which was mainly inhabited by Germans. The Hungarian press often published articles about righteous Hungarian claims towards Austria, and Bethlen and his Foreign Ministers also made such comments. The Hungarian political elite hoped that if Hungary acknowledged the Anschluss, Germany would return Burgenland. But, German political leadership considered the territory – with Austria – as part of Greater Germany. Paul Löbe, the Reichstag President, declared in his speech at Kismarton in 1928 that not only the 6 million Austrians, but also the 60 million Germans stood for this province. Stresemann, when the Austrian Chancellor notified him about the Hungarian claims, exclaimed in outrage: ‘I never promised Burgenland to the Hungarians, and I am ready to declare this publically.’ However, in order to avoid further deterioration of their relationship, both parties refrained from openly raising the issue. Regional economic difficulties, which the Great Depression further exacerbated, helped these German aims. South-East European stability in the 1920s was based on Western financial aid. Germany, also needing financial subvention, missed out on that opportunity. Germany acquired a key position in this equation when it became a market for South-East European export, which these countries needed to pay back Western loans. During the crisis, when demand decreased worldwide, the German market became vital for South-East Europe. Germany thus acquired an economic weapon, something it did not possess in the 1920s. German intentions and the internal problems of South-East Europe – as the historian György Ránki pointed out three decades ago – coincided. The first sign of the change of German intentions in South-East Europe was the surprise declaration of the German-Austrian customs union in March 1931. Concurrently, trade relations with South-East European countries were reviewed and reorganized. Accepting complaints coming from the region, and overcoming the resistance of the German agrarians, Germany signed trade agreements with Hungary on 27 June 1931, and on 18 July 1931 with Romania. These provided advantages for live animal export from both countries to Germany. Hungary and Romania returned the favour by providing custom preferences and reductions for German industrial imports. These ended the principle of ‘greatest preference,’ and free unrestricted trade, and pointed towards the autarchic trading policy of the Third Reich. The tool of any German defence against French and British plans was the instrumentalisation of the antagonism of the Central and South-East European states in the region. As well as the argument that the breaking of these ties was not in the interests of these countries either. In this respect, it based this policy on Sofia in the Balkans, and on Budapest in the Danubian basin. This however, meant that the role of Hungary in German foreign policy had to be reviewed. The first sign of this re-evaluation was the invitation of Bethlen to Berlin in November 1930. Since the war, he was the first statesman from the region to enjoy the hospitality of the German government. His reception was tellingly cordial. The press, which previously struck a critical tone about him and his political system, now presented the territorial losses of Trianon and the achievements of his consolidating efforts, and referring to the centuries old special relationship it noted that both states belonged to the same camp in European politics. The same tone described the comments of German politicians. For example, in the toast of Chancellor Brünning, phrases such as ‘comradeship’ and ‘German-Hungarian eternal friendship’ dominated to such an extent that Bethlen could have said it. What was more important than diplomatic niceties was that at this time the foreign policy of both countries were discussed to a great extent. The basis for Curtius was – and this was the declaration of the new foreign political doctrine – that in the most important questions, such as revisionism and disarmament, German policy went parallel with that of Hungary. Although he added that Germany did not contemplate the creation of a new alliance system, but hoped that in time, cooperation between Hungary and Germany would be closer. The importance of Hungary in German foreign policy is that it is our natural ally in the two most big political questions, which have importance for Germany’s recovery, namely disarmament and the revision of frontiers. […] Regarding frontier revision, the specific aims of these two countries are different, but the common aim is to initiate the revision at any point in the frontiers. The differences in the specific aim have the consequence that the two countries cannot actively support each other. Our special economic interests in Hungary exists because Hungary is situated in the heart of South-East Europe, in the part of Europe, which due to its location we believe would become the market of our industry. Moreover, Hungary is directly adjacent to Austria and lays in the line of the trajectory of our natural economic expansion, and that any combination of economic collaboration depends on its collaboration. Thus, it is our crucial aim to deepen our economic relations with Hungary. The new policy of Germany towards Hungary was received amicably and with satisfaction by the leadership in Budapest. ‘The ice has been broken in Germany. French dominance is over, it is over that German-Hungarian friendship will be looked upon as a nuisance’ – wrote Miklós Kozma, reflecting on Bethlen’s invitation to Berlin and his friendly reception in Berlin, in his diaries. The public, as well as Kozma, believed that German-French antagonism would be soon replaced by a German-Italian rapprochement, which would have automatically meant that Hungary would have gained more importance and that the subject of revision would become active again. According to traditional viewpoints, Adolf Hitler’s accession to power divides the history of Germany between 1919 and 1944 into two eras: the one of the Weimar Republic and the other of Nazi Germany. More recently, German and international historiographies contest this distinct periodisation. They point out that the two eras are much more interlinked than the earlier German post-war historiography admitted, largely preoccupied with the identity crisis of Germany and which called Nazism an error (Betriebsunfall). These new historiographies also point out that Nazi Germany also has its own distinctly separate eras. The ideas of the traditional (industrial and diplomatic) and National Socialist elites about Mitteleuropa and South-East Europe had not only similarities, but also had dissimilarities. For the elites of the industry, the bank sector and the Foreign Ministry acquiring Mitteleuropa was a peaceful economic goal that would have respected national sovereignty in the region. In this respect, this can be considered as the continuation of pre-war liberal imperialist aims. But, the Nazi’s Mitteleuropa concept was permeated with racial and hegemonic ideas, which considered acquiring the territories of inferior people not only as a necessity but the duty of the superior Germanic race. Clearly, such plans were similar to the pan-German ideologies of the early 20th century. Breaking the hegemony of the German agrarians, Hitler took the side of the industrialists and the Foreign Ministry. Thus, Germany concluded bilateral economic treaties with the countries of the region between 1933 and 1935. These treaties expanded the 1931 preferential agreements, which now provided barter trade for the agricultural products and raw materials of the South-East European region to Germany, as well as opened these markets for German industrial products. These treaties were beneficial for South-East Europe, as they now allowed the regional countries to come out of the recession and for their economies to grow. The treaties were also beneficial for Germany, as it, in a matter of years, became dominant both as an exporter and an importer. In 1932, the German economy was only responsible for 10% to 25% of the export and import of the region. In 1938–1939 this was 40% to 55%, and in the case of Bulgaria 65% to 70%. However, the proportion of German imports from Hungary, Bulgaria, Romania and Yugoslavia was still below 10% in 1938, and only grew beyond 10% after 1939. With this, Germany acquired an effective weapon, which could have injured the countries of South-East Europe, without allowing them to respond effectively. Like previously, German ethnic minorities also played a key role in Nazi South-East European policy. Instead of the social and state organisation, which Hitler deemed too bureaucratic and ineffective, Nazi leadership created a new central organisation, the Volksdeutsche Mittelstelle (Coordination Centre for Ethnic Germans), with Joachim von Ribbentrop, the future Foreign Minister, as head. Moving beyond the traditional policy of the protection of minorities, the new organisation envisaged the ethnic Germans to become the 5th column of Nazi Germany. Apart from using it for intelligence purposes, it was utilized to popularize Nazi ideology, as well as for political pressure. These were discouraged not only by Hungarian authorities but other countries of the region as well, and often led to a cooling of the relationship with the Third Reich. The instrumentalisation of economic policy and ethnic German minorities for Germany’s penetration was coupled with the strengthening of scientific and cultural ties. In the capitals of the region, German cultural institutions and German language schools were founded, funds for Humboldt and other scholarships were increased and academic exchanges became more regular. Cultural, artistic and scientific cooperation became particularly significant in the Hungarian and Bulgarian context, while Romania’s and Yugoslavia’s traditional Francophile orientations held back expansion to some extent. Evidently, the aim of German cultural diplomacy was to prepare the region culturally and linguistically, and to use the German language in the long run as a lingua franca. However, the Hungarian leadership and the ‘coffee-house foreign policy-makers’ soon became disillusioned. If Stresemann and Brüning strictly followed a policy in the interest of Germany, altruistic attitudes were even further from the perceptions of Adolf Hitler. On the basis of the notion that Hungarian (and Bulgarian) revisionism would not weaken but in fact strengthen the cooperation of the Little Entente, the National Socialist leadership, similarly to the Weimar Republic, rejected Hungarian propositions for the creation of a revisionist bloc, and thus the possibilities of a closer German-Hungarian cooperation. Thus, Berlin, both in 1934 and 1936, rejected Hungarian propositions for an anti-Little Entente consultative treaty. ‘If we were to agree to the Hungarian proposal’ – commented Baron Neurath in 1936 – ‘we would strengthen the cooperation of the Western powers and the Little Entente.’ Similarly to Bülow, Hitler also recognised the German-Hungarian mutual revisionist interests against Czechoslovakia. In his conferences with Hungarian politicians – such as with Prime Minister Gyula Gömbös in 1933 and 1935, or with the regent Miklós Horthy (1920–44) in 1936 and with Prime Minister Kálmán Darányi (1936–38) in 1937 – the Führer stressed that ‘Hungary should concentrate all her efforts against Czechoslovakia, and that 100% revisionist aims are hopeless.’ Contrastingly, the Serbian and Romanian leaders were assured that Germany did not ‘support Hungarian revisionist ambitions without reservations.’ The same opinion is reflected in the comments of other leaders of the Nazi Empire about South-East Europe. In the autumn of 1934, at the funeral of the Yugoslav king Alexander I, Hermann Göring declared that Germany was not a revisionist state and would not ‘pull chestnuts out of the fire’ for Budapest. Evidently, he aimed to reduce Serbian and Romanian suspicions towards German policy. The ideologue of the Nazi party, Alfred Rosenberg, in articles on 15 November 1936, as well as in October 1937 noted that supporting wider revisionist ambitions were not in the interest of Germany. The choice of words made it clear that it was addressed to Budapest, Belgrade and Bucharest. The Hungarian press always reacted with tension to such articles and comments. German responses to Hungarian protests were initially characterised by a patronizing tone. But as the Hungarian protests became more frequent, German responses became brusquer. ‘It is tiring that I have to comment on our relationship with Hungary every other month’ – exclaimed Neurath after his interview with Hungarian Minister Döme Sztójay (1936–44) on 15 January 1937. From a one hour train ride to the East of Vienna, this purely German city [is where], the real Balkans starts. Here lays Hungary with it plains and gypsies, fleas and cockroaches. The Hungarian nation is sentimental and melancholic, as well as raw and impulsive. […] Austria-Hungary was more like a political union of a dual monarchy than an organic one. Deep inside, Hungarians are closer to the peoples of the Balkans than to our beloved compatriot Austrians. Dissatisfaction with German policy led to attempts at a rapprochement with the Little Entente in 1938. However, neither these nor the earlier Hungarian warnings changed the course of German policy. In Berlin they knew all too well that Hungary would not be able to renounce revision, and that France and the Little Entente would never fulfil these ambitions. To Masirevich’s protest, Neurath mockingly replied that ‘he agrees to a Hungarian alliance with the ‘beloved Czechs.’ ‘I do not know where Hungary would get support for its revisionist ambitions, if it would not get it from us,’ he noted elsewhere. In the context of the cooling bilateral relationship, Germany did not support the ‘separatist’ aims of the German national minorities, which were now beyond cultural aims, to the extent they were supported in Czechoslovakia and Poland. Hitler’s directive in relation to this was that the Hungarian minority question should not be handled in a way that it would burden the German-Hungarian relationship. Regardless of this, a pan-German imperial propaganda was continued with the same intensity, and the differences between the German ethnic minorities and the Hungarian government escalated. At the end of 1935, the extensive German state subvention of the Swabians in Hungary was revealed, and the Hungarian government arrested German students distributing propaganda material in Swabian villages. However, direct meddling into the internal affairs of Hungary – as well as into the affairs of the three other South-East European states – was not that extensive until 1938. Apart from economic and cultural expansion, the policy of Deutschtum manifested only very weakly, and the fascist Hungarian far-right also did not play a significant role. Hitler not only sympathized with Gömbös, but also believed that the following conservative Darányi cabinet was a better solution than the far-right opposition groups around Ferenc Szálasi. In the mid-1930s a new era started in German foreign policy. Initially, the differences were more apparent in the tools utilised than in the goals. The creation of military alliances against the status quo, violence, the threat of military force and the ultima ratio, military action, were not used either between 1930 and 1932 or between 1933 to 1936. However, after 1936, these became the most important tools of German foreign policy. The first sign of change was the reintroduction of conscription in 1935. And then it was continued with the remilitarisation of the Rhineland, the initiations of the first four-year plan – to create the economic foundations of the Blitzkrieg, with intervention in the Spanish Civil War, and with the Berlin-Roma axis and the Anti-Comintern pact with Japan. Both treaties, signed in November 1936, aimed to overthrow the status quo and to create a new world order. This new course, as in 1929 and 1930, coincided with the dismissal of officials both on the top and the middle structures of policy-making. Everybody who did not agree with the new course, or aimed to decelerate change had to leave. The conservative Neurath, who followed the Bismarckian tradition, was replaced with Ribbentrop – Hitler’s political advisor – as head of the Foreign Ministry; and Baron Ernst Weizsacker became the new Under-Secretary of State. Economic Minister and Chairman of the Reich Bank Hjalmar Schacht, who was an advocate of the liberal-imperialist Mitteleuropa, was dismissed in 1937. After changes in the course of policy in 1935–36 and the replacement of officials in 1937–38 it soon became clear that the Nazi Mitteleuropa policy was very different from the conservative notions advocated by Curtius, Neurath and Bülow. It also became clear that for Hitler, Mitteleuropa was not the goal which would make Germany a world power, but was only a tool in achieving world dominance. Thus, this new course utilised new tools, and was the rethinking of old ambitions. This new course of German foreign policy was soon felt in policy towards South-East Europe. The shift occurred in 1938 with the Anschluss and the destruction of Czechoslovakia. The six war years after 1938 produced varied and radical shifts in German South-East European policy and more radical policies than those of the Weimar era and the mid-1930s. However, the aim to turn the region into the political and economic colony of German policy, and after 1941 the German army, was a common thread in this era. If this could not be achieved with ‘peaceful’ economic and political means, it was to be accomplished with the army through the occupation of reluctant countries. Due to the nature of German policy, which aimed to adjust its tactics according to circumstances, plans about Hungary were also less rigid and changed constantly in reaction to circumstances and Hungarian policy. However, different German and Hungarian interpretations of Hungary’s role in the region remained constant. The source of the first minor disagreement was about the new German-Hungarian frontier. Of course, Hungary could not contemplate to protest the Anschluss in the spirit of the Italian-Austrian-Hungarian Agreement – signed in the 1930s – as Italy already acknowledged it. However, many felt that Hungary should have had its share of the ‘loot.’ Officially, through diplomatic channels, remembering earlier German rejections, Hungary did not raise the issue of Burgenland, but through unofficial means Hitler was notified that Hungary would consider it as a ‘noble gesture‘ if that strip of territory, or at least part of it, would be returned to Hungary. This provided ample opportunity for the German Under-Secretary of State to educate the Hungarian leadership about the ethnic composition of Burgenland, as well as to point out that ‘territories in the South West of Lake Neusiedl (Fertő) are ethnically German,’ and that the ‘experts consider the circumstances of the 1921 plebiscite very questionable,’ and thus it would be time that ‘certain Hungarian circles would forget once and for all notions which are out of the question here.’ Moreover, ‘certain German circles’ produced and distributed maps which depicted the Western Transdanubia Deutsch-West-Ungarn labelled as ‘lost territories’ – the Hungarian leadership decided to shelf the problem and never return to it. In his aim to destroy Czechoslovakia, Hitler hoped Hungary would play the role of agent provocateur. He wanted Hungary to be the sole aggressor, and thus the outbreak of conflict would have provided an opportunity for the German army to intervene. On this occasion, disregarding the ethnic principle, in return he offered Slovakia as a whole to Hungary. Certain circles in Hungary, especially the military, were keen for military action; the political elite – the Regent Horthy, the Prime Minister Béla Imrédy (1938–39) and the Foreign Minister Kánya – wary of the unfavourable international circumstances did not want to assume this role. However, they insisted on territorial claims for the entirety of Slovakia and Ruthenia, which went beyond the ethnic principle. This attitude upset Hitler, who, between the Munich Conference of 29 September 1938 and the First Vienna Award of 2 November 1938, where Southern Slovakia was attached to Hungary, noted maliciously to Hungarian politicians lobbying in Berlin: ‘If there were a war, Hungary could have received Slovakia as a whole.’ ‘Now, Hungary has to adapt to the possibilities.’ ‘The Slovaks’ – he continued his monologue – ‘now want to become independent and do not want to unite with Hungary.’ Thus, it was impossible and pointless to enforce a plebiscite on the Slovaks – from which Hungary hoped to regain the Northern territories mostly inhabited by Slovaks. The ‘close coordination of actions’ – Hungary’s political adjustment to Nazi Germany was readily accommodated by the Béla Imrédy government. In late 1938, it agreed to the legalisation of the Volksbund, the National Socialist organisation of ethnic Germans in Hungary, and on 24 February 1939, it joined the Anti-Comintern Pact. At the same time, Budapest promised to leave the League of Nations. It completely abandoned this anti-Nazi Western international organisation on 11 April 1939. As a reward, as well as to share the responsibility, Hitler agreed to the Hungarian occupation of the mostly Ruthenian inhabited Subcarpathian Ruthenia on 15–16 March 1939. This action was a part of a Czechoslovakia destruction operation, which also included the creation of Germany’s Protectorate of Bohemia and Moravia and the independent Slovak State. With the Austrian Anschluss in 1938 and the establishment of the Protectorate of Bohemia and Moravia in 1939, the core of the greater-German Mitteleuropa was created. As a result, the French security system collapsed; the elbowroom of the states of South-East Europe was now reduced to a minimum. Winston Churchill accurately noted at the end of 1938, that the Danube valley until the Black Sea, now lay open before Hitler; and Ribbentrop in April 1939 claimed that ‘South-East Europe is our sphere of influence.’ The opportunity to tighten economic relations with the region, and to expand political influence there as far as possible was taken by the Germans. In the economic sphere, Germany already had a dominating role in most countries of the region since the 1933–36 clearing treaties. Although these treaties created dependency and conserved outdated structures, they were still based on mutual benefits, and did not cause the direct exploitation of the region. However, the 1938–40 treaties did not aim to secure mutual markets, but to totally integrate the national economies into the German dominated greater regional economic sphere. Hitler openly declared this aim in regards to Romania: ‘It would be better for Romania to immediately renounce its plans for industrialization. It should direct its agricultural products to the German market. In return, we will supply industrial products.’ However, the German government did not need to put much pressure in order to conclude such treaties, because for these countries the German market was essential. Some countries, like Hungary, even asked Germany to sign such treaties. Their dissatisfaction only mounted during WWII when Germany was not able to supply these countries with industrial products anymore, and, in effect, forced a zero percent trade credit on them. From the political point of view, Berlin’s aim in 1938–1941 was adhering Romania and Yugoslavia – as it already did with Hungary and Bulgaria – closer to the German sphere of influence. In order to ensure undisturbed economic cooperation with these countries, Germany still refused to endorse Hungarian and Bulgarian revisionist ambitions, and supported a rapprochement on the basis of the status quo. Consequently, in the second part of 1938, Yugoslavia and Romania moved closer to Germany. For example, Romanian King Carol II (1930–40), during his visit to Hitler on 28 November 1938, declared, ‘he wanted a closer cooperation with Germany.’ However, after the destruction of Czechoslovakia, when Britain and France made a final attempt at blocking German penetration to the region, this process halted and reversed. In March 1939, similarly to Poland, Greece and Turkey, Romania also accepted the Anglo-French guarantee of its independence. Simultaneously, the pro-German Milan Stojadinović cabinet (1935–39) fell in Yugoslavia, and was replaced by the pro-Western and pro-Russian Dragiša Cvetković government (1939–41). Between the Polish campaign in September 1939 and the Battle of France in May–June 1940, the maximal German aims in South-East Europe were Romanian-Hungarian and Yugoslav-Hungarian rapprochement, the minimal to guarantee peace. The Hungarian elite were receptive to an agreement with Yugoslavia, and did not step up against Romania with arms. However, they declared on every occasion that, ‘Hungary had territorial claims on Romania,’ ‘Which had to be fulfilled before the end of the war.’ For the sake of Balkan peace, Hitler rejected such demands until the summer of 1940. However, in the summer of 1940, rather unexpectedly, he changed his mind, and took on the role of arbitrator in the dispute. Paradoxically, the reason for his change of attitude was the same, which rejected dealing with the issue, peace in the Balkans and economic interests. The problem escalated with the Soviet threats to use force if Romania did not transfer Northern Bukovina and Bessarabia at the end of June 1940. In this situation Budapest wanted to move immediately. It increased Budapest’s determination that it could seemingly count on Moscow’s support. ‘If we are leaving free reign to event, weapons will fire themselves here against Romania’ – the German Envoy Erdmannsdorff in Budapest described the mood in Hungary on 2 July. But war would have undoubtedly meant the cessation of Romanian oil shipments to Germany and the penetration of the Red Army in the Balkans. Hitler could not allow either of these to happen. Romanian oil was as important to him as Swedish iron, and obviously, allowing the Soviet Union to take the initiative was not in his interest. Hitler’s calculation was correct. With the division of Transylvania he acquired a new weapon, which could be used against both countries effectively at any time. Consequently, these two countries embarked on a competition for the goodwill of Berlin, which was unprecedented among the allies of Nazi Germany. It was evident in the autumn of 1940 when, after the signing of the Tripartite Pact between Berlin, Rome and Tokyo; Hungary and Romania were competing with each other, and joined the pact only a few days apart. The same was repeated after the declaration of war against the Soviet Union in the summer of 1941. ‘As the ally of Britain, Romania lost everything, now as the ally of the Axis, it will get everything back. This revisionism had started already,’ Erdmannsdorff claimed on 18 July 1941, pointing to the pro-German characteristics of Romanian foreign policy. In autumn of 1940, the primary aim of German policy in South-East Europe was the involvement of Yugoslavia in the Nazi alliance system. The Yugoslav-Hungarian Treaty of Eternal Friendship was signed in this sense on the basis of the status quo in December 1940. This treaty, and Yugoslavia’s adherence to the Tripartite Pact on 25 March 1941, seemed to shelf Hungarian revisionist ambitions in that country indefinitely. But, the turn of events in Belgrade – the coup d’état on 27 March, and the Yugoslav Treaty of Friendship signed with the Soviet Union, pushed German policy towards Yugoslavia, and German perceptions about Hungarian revisionism, onto a different course. The Yugoslav coup, the failures of Italy in the Greek campaign started in October 1940, and the appearance of the British army and navy in the Aegean Sea threatened the rear of the envisioned campaign against the Soviet Union and the Balkans seemed to emerge as the base for a second front. To avoid this, Hitler immediately decided to destroy Yugoslavia, and to support Hungarian revisionist ambitions. He had two friends in the Balkans – Hungary and Bulgaria – and he cannot see why, now after such turn of events, the problems of these countries cannot be solved once and for all, […] if there was to be a war, Hungary has Germany’s support for her ambitions. And, regarding Hungary’s ambitions to have an outlet in the Adriatic, Germany supports these wishes. Once and for all, he will cut out the Balkan’s tumor. […] Now, the time has come for making every injustice right. After all, historically, Germany and Hungary always belong together. Both countries face the enormous Slavic wave. The only reason for these promises, and the repetition of Hungarian arguments in Berlin, was to guarantee Hungarian participation in the war against Yugoslavia. Declining this or German military passage through Hungary – argued the historian Andreas Fritz Hillgruber – would certainly lead to the German invasion of Hungary also. Fearing this, and of course in order to fulfil its territorial ambitions, regardless of London’s warnings, Budapest decided to participate in the campaign. With promises to support Bulgarian ambitions for an outlet on the Aegean Sea, Germany was also able to convince Sofia to join the campaign. After the successful completion of the Marita campaign against Yugoslavia in April 1941, such encouragements to Hungary ended from Berlin. The importance of Hungary diminished again and Hitler did not keep the promises he made to Hungary. The ethnically very mixed (Hungarian, Romanian, Serb and German) Banat, what he promised to Hungary, but what was also claimed by Romania, remained under German military administration. Hitler wanted to decide its fate only after the war. He also left the question of the Muraköz – north of the Drava – open, in order to ensure the security of the Csáktornya-Ljubljana-Fiume railway, what Hungary claimed on historical precedent. However, Zagreb claimed the territory on the ethnic principle. With this, Hitler also contributed to the escalation of the Hungarian-Croatian relationship, which started as friendly. Adding the Slovak-Hungarian and Romanian-Hungarian antagonisms, the resurgence of the Little Entente under German leadership became a reality. Such initiatives came from Slovakia in the summer of 1941, and gained positive reception both in Bucharest and Zagreb. Although a German veto stopped such initiatives, and as Ribbentrop said ‘for the sake of winning the war, “domestic violence” has to cease,’ but it remained informally in the politics of these three states towards Hungary. The difference between this alliance and the 1920s to 1930s Little Entente under French leadership was that the latter was a defensive cooperation on the basis of the status quo, but this new cooperation within the German alliance system was offensive and aimed to curtail Hungarian territorial gains. To this end, Romania was even inclined to involve Bulgaria in this alliance, and thus openly acknowledging the Bulgarian cession of Southern Dobruja. With the disintegration of Yugoslavia in April 1941, German hegemony in Europe became complete. Now political hegemony supplemented the already existing economic dominance. Slovakia and Croatia were only independent on paper and were puppet states, their existence completely depended on Hitler. The Serb territories were under German military administration and General Nedić’s quisling government. The elbowroom of Bulgaria, Romania and Hungary were reduced to the minimum. Officially, Hungarian sovereignty was spared, but it depended on German interests. Between the end of the Battle of France in the middle of 1940 and the bogging down of the Wehrmacht offensive at the gates of Moscow by the end of 1941, the departments of the German government worked out detailed plans about the working and structure of the European great economic sphere. As a common characteristic, these plans all considered South-East Europe one unit, and thus divided it not only from Ostland – the German Lebensraum – but also from the otherwise closely integrated Western and Northern European states, which were closely integrated both politically and economically. The basis of former head of the Economic division, Karl Ritter’s plan in the German Foreign Ministry was that economic and political dominance in South-East Europe was a long term interest, thus deepening cooperation in this region was not necessary. ‘It would be enough – he noted – to preserve and develop the current level of relations.’ The young, 34 year old economic expert of the Ministry of Economy, Gustav Schlotter – with the encouragement of Göring and Walter Funk (Reich Minister of Economics in 1938–45) – worked out a deeper plan for economic cooperation. According to his plans, South-East Europe should integrate to the future Central European German Mitteleuropa core with a custom and financial union. Leading Nazi politician Werner Best, governor of Denmark from 1942, thought about post-war Mitteleuropa in terms of the level of political dependency from the ruling German nation. Werner Best divided this region into four groups. The first group, which comprised Hungary, Romania, Bulgaria, as well as Italy and Finland, would have been disposed with complete political and state administration. This administration could have been led by locals, of course ‘according to the advice and viewpoints of the governing nation.’ The countries of the second group (France, Belgium, the Netherlands, Denmark, and probably Norway, Slovakia and Croatia) would still hold some autonomy in its local administration, but this would have been completely under the direction of ‘the governing nation.’ Countries in the third group (Estonia, Lithuania and the Czech-Moravian territories) would have local administration, but for countries in the ‘fourth importance’ (Poland, Latvia, Ukraine and Belorussia), Best envisaged a form of government which did not even have that but a form of colonial administration which would have completely excluded the local population. The ‘natives’ could have lived their lives in the small localities of the family, neighbours and religion. The planning of political borders received relatively little attention from peace planners. This is understandable, as under such close cooperation, political frontiers would have been less important than with sovereign countries. However, on occasion – when it involved the problem of German minorities – the question of frontiers was discussed. In the context of Hungary, it was particularly the fate and extent of Transdanubia which was uncertain. Based on the initial plans of the 1930s, the Volksdeutsche Mittelstelle – which was directed by the leader of the SS – initially envisaged the expulsion of Hungarians from Transdanubia and for it to be colonised and populated by Germans. Later, it aimed to create a strip of German settlements 50–100km wide along the river Danube south of Mohács. In relation to this, in 1940–41, the creation of a separate German province (Pritz Eugen Gau) in the Banat, Bačka (Bácska) and Baranya was considered. The future frontier of the Reich and Hungary was another issue. The Reichsstelle für Raumordnung (Reich Office for Spatial Planning) in Berlin aimed to extend the Südmark to the Balaton-Ljubljana line. Others would have been satisfied with extending the frontier on the basis of ethnicity, with the annexation of Kőszeg, Szombathely, Mosonmagyaróvár and Sopron and their surroundings. The undated memorandum ‘Annexation of German Western-Hungary to the German Empire’ – originating from Vienna – counted the transfer of 1250 km2 of territory to the Reich. Here, out of the 120 thousand inhabitants, 70 thousand were ethnic Germans. The transfer of this territory – argued the memorandum – ‘would not be a great sacrifice for Hungary,’ but it would guarantee the food supply of Vienna and would make the Southeast frontier of the Reich more secure. Elaborations of long term plans were neglected. Events on the fronts initially made these untimely, and later pointless. The necessity of planning for a prolonged war – instead of a Blitzkrieg – shocked Hitler. In early 1942, he stopped any work on developing long-term plans, and gave instructions to subject all efforts to winning the war. With this intent, a new phase in German South-East European policy was initiated – the complete exploitation of the region. It is well known that Hitler and the military leadership, during the preparation of the Barbarossa operation against the Soviet Union, only counted on the participation of Romania and Finland from his allies. The swift Hungarian, Slovak and Croatian participation thus was not the result of some kind of immense German pressure, but can be explained with the rivalry of these states for German favours. As of late 1941-early 1942, the situation had changed. Hitler demanded maximal efforts from South-East European countries, just like from Germans, and his relationship to these countries was determined by the extent to which they were willing to send their male populations to the Eastern front to fight, and to what extent they were willing to make their resources (food supplies and raw materials) available for the Reich. Thus, economic treaties signed in the 1930s and in 1939–40 soon became irrelevant. After 1941, the region had to provide interest-free trade loans for the Reich. Weapons and war materials sent in return only covered a small part of this volume. After Hitler’s hatred towards the Jews grew to pathological levels, to what extent a particular South-East European country was willing to exterminate (or to help exterminate) its own Jewish population also became crucial in the eyes of Hitler and the Nazis. Facts and numerous comments from Nazi leaders show that from the perspective of these criteria, Romania’s reputation was the highest. After Marshall Antonescu’s far-right takeover in Romania in the autumn of 1940, it was he who became Hitler’s favourite, and Romania, his most important ally. Among foreign statesmen, he received the highest German decorations, and he had the privilege to meet the Fuhrer and Chancellor more regularly (20 times, while Benito Mussolini only 15 times). On the other hand, Hungary, which until 1938 was very keen on close cooperation, although with changing intensity, continued to resist German demands. Of course, visions about ‘companionship,’ ‘comradeship’ and a German-Hungarian alliance prevailed, and their significance even increased. Among the Hungarian elite, it was mostly the high command that had such illusory visions. The most radical among them was Henrik Werth, who, in his 14 June 1941 memorandum argued for joining the war immediately: ‘… we can only hope for further territorial gains if we remain dedicated to the political goals of the Axis; as a reward of this we will certainly be able to completely restore Greater Hungary.’ The judgment of Prime Minister László Bárdossy (1941–42) was also clouded. In his parliamentary speech in January 1942, he said it was the historical destiny of Hungary to regain and control the Carpathian basin as a whole, and described Hungary as a strong point of European stability and cooperation, whose intellectual and economic influence was already felt far beyond its borders. Government Member of Parliament Béla Marton talked in the same sense when he noted, ‘Hungary’s sacrifices on the Eastern front will guarantee it a leading role in Eastern Europe.’ Béla Imrédy also argued for every sacrifice for the purpose of total war. Some even dared to claim – such as Count Imre Károlyi – that for the purpose of a successful war, Hungary should become a German protectorate. However, official Hungarian policy under the premiership of Miklós Kállay (1942–44) was not determined by such fantasies as doubts remained about a final German victory. Similarly to his predecessor Prime Minister Pál Teleki, he preferred, in the long run, an Anglo-Saxon orientation. After the hesitation of 1940–41, from late 1941 to early 1942 this course of policy in Budapest once again became dominant. However, it has to be admitted that in this course – which was advocated mostly by aristocrats – illusions about Hungarian dominance in the region were also prevalent. But, while military and far-right circles aimed to fulfil the restoration of St. Stephen’s state by cooperating with Nazi Germany, Horthy and the conservative circles dominating the government wanted the same but without Germany and with a rapprochement with the Anglo-Saxon powers. The Budapest rejection or reluctant fulfilment of German demands, which asked for the deployment of the entire Hungarian army, the continued increase of food and raw material supplies to Germany and the deportation of the Jews to the North, as well as the secret negotiations with the Anglo-Saxon powers – which German intelligence continuously monitored – caused understandable dissatisfaction in Berlin. In an interview on 20 October 1942, Weizsacker summarized German grievances to Sztójay in five points: 1) Hungary’s persistent references to the state of St Stephen; 2) the social system of Hungary was outdated compared to Germany’s; 3) ‘the handling of the Jewish question, which for Germany, was unacceptable’; 4) compared to Romania, Hungary is reluctant to commit to the fight with its army, and saves it for a potential offensive war against Romania; 5) egotistical handling of the nationality question. On 10 December 1943, a prominent Nazi, Edmund Veesenmayer, summarized German perceptions about Hungary. The future Nazi governor of Hungary notes: ‘Hungary proved that it was unable to conduct a national life in the past, and will remain so in the future.’ Veesenmayer argued: ‘It does not recognise its interests [and] it does not take its share from the common fighting, thus it is imperative that a German governor would be placed alongside, or even better ‘on top of the Hungarian government.’ This way, the Reich can get ‘twice or even more supplies from Hungary,’ it could ‘deal with the Jewish question there,’ as well Hungary should take its fair share from the fighting according to its means. Namely: ‘The deployment of every Hungarian peasant, worker or soldier would relieve resources of the Führer. Every bleeding Hungarian relieves our bleeding, strengthens our reserves, and helps us to preserve our strength for the tasks of the post-war period.’ The only German elite group, which still respected Hungarians, was some of the generals and officers of the Eastern front who had the opportunity to experience the courage of the Hungarian army. However, their voices were unheard, as their reports got stuck at the high command levels. Regardless of continued pressure from Berlin, the Kállay cabinet’s non-compliance policy towards Germany raised the question in Berlin of reversing Hungary’s recent (1938–41) territorial gains. If Hungary would withdraw its troops from the Eastern front and decline deploying them in the Balkans, noted Dietrich von Jagow, the German Minister in Budapest (1941–44), this would have been interpreted as ‘Hungary declining its territorial ambitions, which would mean that its Trianon frontiers would be restored.’ Hitler had the same opinion. He already told Antonescu that ‘we would understand very much if Romania, apart from restoring its frontier, would also gain Odessa and a buffer zone.’ Moreover, on 23 March 1944, he made the following personal remark to the Conducator: ‘Because of the disloyalty of the Hungarian government, and because neither the Hungarian nor the Romanian governments accepted the Second Vienna Award, and because Italy is out of the picture, Germany does not think that it should function as the signatory of the Vienna Award.’ It was typical of Hitler’s cynicism that earlier he told Hungarian leaders that he would not protest if after the ‘Great War’ Hungary would ‘solve’ the Transylvanian question with arms. Because of its food supplies and army – contrary to Finland and Bulgaria – but mostly because of its central geographical location, Hitler strongly insisted on retaining Hungary. ‘A catastrophe in Hungary would mean the catastrophe of the entire Balkans.’ Thus, when, after the signing of the Moscow armistice in October 1944 by the Hungarian delegation, Horthy attempted to exit the war, Hitler removed him and transferred power to the Hungarian National Socialists. The German army on the other hand received orders to resist until the end in Hungary. The geographical position of Hungary, which was a clear advantage in the development of economic relations, now became Hungary’s disadvantage in the war, which meant more economic and human casualties. Thus, a clearing of the ruins of the Nazi Mitteleuropa could only commence in Budapest and Hungary a few weeks earlier than in Berlin and Germany. Hungarian communists used this circumstance for decades to untruly label Hungary as Hitler’s last ally. It appeared first in the manifesto of the Hungarian Communist Party on 30 November 1944, and was adopted by the Hungarian National Liberation Front without change. William Henderson, Friedrich List, Reutlingen, 1989, 121–34. Compare to: Juda Pentman, Die Zollunionsidee und ihre Wandlungen im Rahmen der Wirtschaftspolitischen Ideen und der Wirtschaftspolitik des 19. Jahrhunderts bis zur Gemenwart, Jena: G. Fischer, 1917. Henry Cord Meyer, Mittel Europe in German Thought and Action 1815–1945. The Hague: International Scolars forum, 1955; Fritz Fischer, Krieg der Illusionen. Düsseldorf: Droste, 1969; and one of the new theoretical reviews: Woodruff D. Smith, The Ideological Origins of Nazi Imperialism. New York-Oxford: Oxford UP, 1986. Fritz Fischer, Griff nach der Weltmacht. Düsseldorf, 1984, 94. Fischer, Griff nach der Weltmacht, 94; Gyula Tokody, Az Össznémet Szövetség (Alldeutscher Verband) és közép-európai tervei 1890–1918. Budapest: Akadémiai, 1959, 79–95. Die politische Lage in Südosteuropa, 28 August 1929 // Archiv des Auswärtigen Amtes, Bonn (hereafter, AA). Politische Abteilung II. Generell. Pol. 4. Balkan. Bd. 3.; Hans-Paul Höpfner, Deutsche Südosteuropapolitik in der Weimarer Republik. Frankfurt, Bern: Peter Lang, 1983, 94–5. Akten zur deutschen auswärtigen Politik (hereafter, ADAP), Serie B. Bd. III, Göttingen: Vandenhoeck und Ruprecht, 1968, 353. Höpfner, Deutsche Südosteuropapolitik, 116; Freytag (Bucharest), 20 Nov. 1925 // AA, Politische Abteilung II. Generell. Pol. 4. Balkan. Bd. 2. ADAP, Serie B. Bd. III, 353. ADAP, Serie B. Bd. VII, Göttingen : Vandenhoeck und Ruprecht, 1974, 48–9. Höpfner, Deutsche Südosteuropapolitik, 303–42; Lóránt Tilkovsky, ‘Németország és a magyar nemzetiségpolitika, 1921–1924,’ Századok, 1 (1978), 3–48; Lóránt Tilkovsky, ‘Németország és a magyar nemzetiségpolitika, 1924–1929,’ Történelmi Szemle, 1 (1980), 52–90. Die politische Lage in Südosteuropa, 27 August 1927 // AA, Politische Abteilung II. Generell. Pol. 4. Balkan. Bd. 2. For French lenience, see: ADAP, Serie B. Bd. VII. 483–4; for German foreign policy in general: Andreas Hillgruber, Die gescheiterte Grossmarcht. Eine Skizze des Deutschen Reiches 1871–1945. Düsseldorf : Dorte, 1980, 63–71. Ludwig Windischgratz, Helden und Halunken, Wien-München-Zürich: W. Frick-Verlag, 1965, 165. ADAP, Serie B. Bd. III, 354. ADAP, Serie B. Bd. VII, 159–60. ADAP, Serie B. Bd. IX (1), Göttingen : Vandenhoeck und Ruprecht, 1976, Schubert, 22 May 1928. ADAP, Serie B. Bd. VIII, Göttingen: Vandenhoeck und Ruprecht, 1976, 197–8. AA. Politische Abteilung II. Ungarn. Pol. 2. Bd. I, compare to: Bruno Thoss: Der Ludendorff-Kreis 1919–1923. München als Zentrum der mitteleuropäischen Gegenrevolution zwischen Revolution und Hitler-Putsch. München: Stadtarchiv, 1978. For school policy, see Tilkovsky, ‘Németország és a magyar nemzetiségpolitika, 1924–1929’, 76–7; for the declarations of Bethlen: ADAP, Serie B. Bd. XIV. Göttingen: Vandenhoeck und Ruprecht, 1980, 235–8 and Gróf Bethlen István beszédei és irásai, II, Budapest: Genius, 1933, 123. Fejes Judit, Magyar-német kapcsolatok 1928–1932. Budapest: Akadémiai, 1981, 26–55. ADAP, Serie B. Bd. III. 212 and 218–20, also Bd. X. 341–4. Adatgyűjtemény. 12 November 1928 and Berlini út, 18–27 Nov. 1928 // Magyar Országos Levéltár (hereafter, MOL), K 429 Kozma Miklós iratai, 2. Csomó. Koester, 18 July 1929; Zechlin, 4 August 1929; Curtius, 12 January 1930 // AA, Politische Abteilung II. Ungarn Pol. 2. Bd. 3. Die politische Lage in Südeuropa, 28 August 1929 // AA, Generell. Pol. 4 Balkan Bd. 3. Dirk Stegman, ‘Mitteleuropa 1925–1934: Zum Problem der Kontinuitat deutscher Aussenhandelpolitik von Stresemann bis Hitler,’in: Industrielle Gesellschaft und politisches System. Bonn: Verlag Neue Gesellschaft, 1978, 203–21; Roswitha Berndt, ‘Wirtschaftliche Mitteleuropaplane des deutschen Imperialismus 1926–1931,’ in: Grundfragen der Deutschen Aussenpolitik seit 1871. Darmstadt: Wissenschaftliche Buchgesellschaft, 1975, 305–34. Hans Jurgen Schroeder, ‘Deutsches Sudosteuropapolitik 1929–1936,’ Geschichte und Gesellschaft 1(1976), 10–3. Ránki György, ‘Hitel vagy piac,’ in: Mozgásterek, kényszerpályák, Budapest: Magvető, 1983, 341–82. Schroeder, Deutsches Sudosteuropapolitik, 15–6. For the German-Hungarian treaty, see: Fejes, Magyar-német kapcsolatok, 121–37. Ránki György, Gazdaság és külpolitika. Budapest: Magvető, 1981, 112–220 (117). Bundesarchiv, Koblenz R 43. I/157. 13–14 and 36–54. For the reaction of the German press: Zentrales Staatsarchiv, Potsdam. 61 Re. Pressarchiv Nr. 491. B. 9234., 88–105. A summary of the meeting has been published in: Iratok az ellenforradalmi rendszer történetéhez. Volume 4. Budapest: Kossuth, 1967, 450–6. ADAP, Serie B. Bd. XVI. 464–5. The correspondence was analysed in detail by Fejes, Magyar-német kapcsolatok, 98–100. Notizen, 26 November 1932 and Aktenvermerk, 1 December 1932 // AA, Politische Abteilung II. Ungarn. Pol. 2 Bd. 4. Adatgyűjtemény, 10–13 December 1930 // MOL, K 429. Kozma Miklós iratai, 3. csomó. Bernd-Jürgen Wendt, ”Mitteleuropa’ – Zur Kontinuität der duetschen Raumpolitik im zwanzigsten Jahrhundert,’ in: Wolfgang Bachofer and Holger Fischer (eds. ), Ungarn, Deutschland. Studien zu Sprache, Kultur, Geographie und Geschichte. München: Trofenik, 1983. 299–304, (quotations on page 318). Hillgruber, Die gescheiterte Grossmarcht, 77. Ránki, Gazdaság és külpolitika, 235–6. Ránki, Gazdaság és külpolitika, 247–349, and more recently Othmar Nikola Haberl, ’Südoseuropa und das Deutsche Reich vor dem zweiten Weltkrieg,’ Südosteuropa, 39/9(1990): 514–25. Raymond Poidevin, Die unruhige Grossmacht. Freiburg-Würzburg, 1985, 181–91. Mackensen, 15 October 1934 // AA, Politische Abteilung II. Ungarn. Pol. 2. Bd. 5., and also, Büro des Staatssekretarärs. R. 29784. 28 April 1939. Anlage 4. György Ránki (et al. ), A Wilhelmstrasse és Magyarország. Budapest: Kossuth, 1968, 67. For the foreign policy of Gömbos, see: Pál Pritz, Magyarország külpolitikája Gömbös Gyula miniszterelnöksége idején 1932–1936. Budapest 1982. Nagy Sándor Zoltán and dr. Horváth Kálmán, Letters to Adolf Hitler, 14 February 1935, 11 October 1934 // AA, Politische Abteilung II. Pol. 2. Ungarn. Bd. 5. Minute by Neurath, 4 May 1936 // AA, Politische Abteilung II. Pol. 2. Ungarn. Bd. 5; Minute by Bülow, 11 January 1934 // AA, Geheimakten. Ungarn. Pol. 2. 2. R. 30513. Andreas Hillgruber, Deusche Aussenpolitik im Donauraum 1930 bis 1939. In: Die Zerstörung Europas. Frankfurt-Berlin, 1988. 140; Andreas Hillgruber, ‘Deutschland und Ungarn, 1933–1944,’ Wehrwissenschaftliche Rundschau, 1 (1959), 653–4; Martin Broszat, ‘Deutschland-Ungarn-Rumanien,‘ Historische Zeitschrift, 206 (1968), 45–52. Broszat, ‘Deutschland-Ungarn-Rumanien,’ 49–53: in more detail see: Pritz, Magyarország külpolitikája, 203–19. Minute by Neurath, 15 January 1937 // AA, Politische Abteilung IV. Pol. 2. Ungarn. Bd. 1. Minute by Schoen, 8 February 1932 // AA, Politische Abteilung II. Ungarn Pol. 2. Bd. 4. Minute by Köpke, 9 March 1934 // AA, Politische Abteilung II. Ungarn Pol. 2. Bd. 5; Minute by Ermannsdorff, 10 September 1937// AA, Politische Abteilung IV. Pol. 2. Ungarn Bd. 2. A Wilhelmstrasse és Magyarország, 199. A Wilhelmstrasse és Magyarország, 88, 89, compare to 199; Pritz, Magyarország külpolitikája, 210–4. Minute by Neurath, 17 November 1934 // AA, Politische Abteilung II. Ungarn Pol. 2. Bd. 5; Minute by Neurath, 25 November 1936 // AA, Politische Abteilung IV. Ungarn. Bd. 1. A Wilhelmstrasse és Magyarország, 90–1. A Wilhelmstrasse és Magyarország, 13; compare to: Lóránt Tilkovszky, Hét évtized a magyarországi németek történetéből 1919–1989. Budapest: Kossoth, 1989, 73–92. A Wilhelmstrasse és Magyarország, 269. Hillgruber, Die gescheiterte Grossmarcht, 78–85 and Wendt, ‘Mitteleuropa’, 325–9. AA, Politische Abteilung II. Ungarn Pol. 2. Bd. 2 ; A Wilhelmstrasse és Magyarország, 265. A Wilhelmstrasse és Magyarország, 303–6, compare to: Juhász Gyula: Magyarország külpolitikája 1919–1945. Budapest. Kossuth, 1988, 186–95. Report by Ermannsdorff, 12 November 1938 // AA, Politische Abteilung IV. Ungarn Pol. 2. Bd. 2; Count István Bethlen, ‘Az új esztendő küszöbén,’ Pesti Napló, 1 January 1939. A Wilhelmstrasse és Magyarország, 343–5 and 356. In more detail, see: Lóránt Tilkovszky, A revízió és nemzetiségpolitika Magyarországon 1938–1941, Budapest: Akadémiai, 1967; and Juhász, Magyarország külpolitikája, 199–214. Broszat, ‘Deutschland-Ungarn-Rumanien,’ 61; A Wilhelmstrasse és Magyarország, 385. Ránki György, A Harmadik Birodalom árnyékában. Budapest: Magvető, 1988, 105. Michael Riemenschneider, Die deutsche Wirtschaftspolitik gegenüber Ungarn 1933–1944, Frankfurt-Bern-New York-Paris: Peter Lang, 1987, 141–78. Hillgruber, ‘Deusche Aussenpolitik,’ 142–4; Broszat, ‘Deutschland-Ungarn-Rumanien,’ 72–3. A Wilhelmstrasse és Magyarország, 386, 418. A Wilhelmstrasse és Magyarország, 419. In more detail, see: Manfred Nebelin, Deutsche Ungarpolitik 1939–1941, Opladen: Springer, 1989, 9–76. A Wilhelmstrasse és Magyarország, 468, 501. A Wilhelmstrasse és Magyarország, 504, 516–7; compare to: Nebelin, Deutsche Ungarpolitik, 77–134. A Wilhelmstrasse és Magyarország, 530; compare to: Nebelin, Deutsche Ungarpolitik, 149; Broszat, ‘Deutschland-Ungarn-Rumanien,’ 67. Report by Ermannsdorff, 18 July 1941 // AA, Büro des Staatssekretars. Ungarn, R 29787. A Wilhelmstrasse és Magyarország, 562–3. Hillgruber, ‘Deutschland und Ungarn 1933–1944,’ 661. Detlef Vogel, ‘Deutschland und Südosteuropa,’ in: Wolfgang Michalka (ed. ), Der Zweite Weltkrieg. München-Zürich: Piper, 1989, 536. A Wilhelmstrasse és Magyarország, 601, 628, also: Ránki, A Harmadik Birodalom, 122. Jean Freymond, Le IIIe Reich et la réorganisation économique de l’Europe 1940–1942. Origines et projets, Leiden, 1974, 106–42; and Riemenschneider, Die deutsche Wirtschaftspolitik, 179–84. Werner Best, ‘Grossraumordnung und Grossraumverwaltung,’ Zeitschrift fur Politik, 32 (1942), 406–12. It is important to note that countries are not named in this source, thus this categorization is ours. Wolfdieter Bihl, ‘Zur nationalsozialistischen Ungarnpolitik 1940/41,’ Österreichische Osthefte, 11 (1969), 21–4. Ránki, A Harmadik Birodalom, 64. Dombrády Lóránd, Hadsereg és politika Magyarországon 1938–1941. Budapest: Kossuth, 1986, 226. Note by Jagow, 20 January 1943 // AA, Inland II. Geheim. Ungarn. Bd. 4. Gyula Juhász (ed. ), Magyar-brit titkos tárgyalások 1943-ban. Budapest: Kossuth, 1978. AA, Inland II. geheim. Ungarn. Bd. 5. 30 October 1942. Ránki, A Harmadik Birodalom, 93, 97, 141–3; see also: Péter Gosztonyi, ’Hogyan vélekedett Hitler a magyarokról?,’ in: Magyarország a második világháborúban. München: Herp, 1984, 78–85. A Wilhelmstrasse és Magyarország, 743–751. Hillgruber, ‘Deutschland und Ungarn, 1933–1944,’ 671. A Wilhelmstrasse és Magyarország, 733. A Wilhelmstrasse és Magyarország, 671–673; Ránki, A Harmadik Birodalom, 123, 130–1. Bethlen István emlékirata 1944. Szerk. Ilona Bolza and Ignác Romsics, Budapest: Zrinyi, 1988, 144–5. A Wilhelmstrasse és Magyarország, 791. A Wilhelmstrasse és Magyarország, 890.